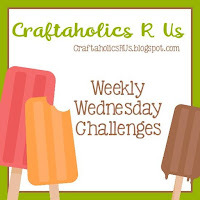 The Green team is back with a new challenge at Craftaholics R Us #2 and the theme for this weeks challenge is "PATTERN PAPERS"
Oh this was fun.. I found this awesome pad of designer paper and sorry I do not know the name. The front cover was not there. The heart background paper was perfect. This would be great for giving to a guy.. I tried to keep this card masculine. The large heart was already there also. I chose the Simon Says stamp set and stamped the Always in brown ink. I used the top margin of the paper that was green and stamped the "thinking of you" and cut a thin strip. I then found some other awesome pieces of dp in the pad and stamped the SS flowers and leaves. I fussy cut them out. I did add some copic in greens to the leaves to give them color and you can see the design in a few places coming through. I adhered the images down some on foam dots and some right to the background. I added some orange Nuvo drops to the flower center and some teal /turquoise Nuvo drops to the background. I then added this to a piece of Kraft card stock. Billie, this is a beautiful card. Love the way that you inked that. Beautifully made - very elegant. Sweet flower. Thanks for taking a par in Scrapping4fun. Great use of pattern for a really pretty card. Thanks for joining in at City Crafter. using the pattern paper for your flower gives it a lot of visual texture, and I really like the way you used the Nuvo drops to carry the color to the background.Thanks for joining the HeARTful Stamping Challenge this week! Lovely, thanks for sharing with us at Crafty Sentimnets Designs. Love you paper pieced flower, makes a fabulous card. Beautiful card, Thank you for Joining us at Scrapping4funChallenge and waiting to see next time.